The Airbus H-65 Dolphin helicopters of the U.S. Coast Guard (USCG) have undergone multiple upgrades since the original HH-65A models entered service in the mid-1980s. Now, the USCG is preparing to upgrade its Dolphins once again, from MH-65D to MH-65E models with advanced digital cockpits. 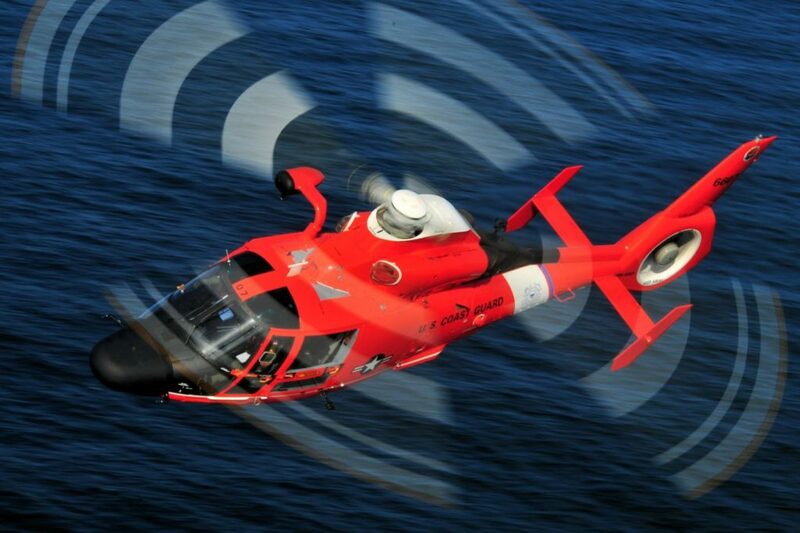 The upgrade is being developed in partnership with Rockwell Collins, which will be equipping these “Echo” models with a version of the Common Avionics Architecture System (CAAS) that is already in use on the USCG’s Sikorsky MH-60Ts. Most visibly, the upgrade will enhance the MH-65 cockpit with four large multi-function displays (MFDs), incorporating new features and tools to enhance pilots’ situational awareness and support their demanding missions. The upgrade will also meet the Federal Aviation Administration’s standards for area navigation, allowing Coast Guard Dolphins to safely operate within congested civil airspace without sacrificing the efficiency of their missions. Moreover, the system’s modern electronics and open architecture are designed to accommodate further enhancements well into the future, which could keep these aircraft flying well past 2030. “If you look at the 30,000-foot level down at this, this is going from an analog aircraft to a much more digital, modern aircraft,” explained Duane Grave, Rockwell Collins’ principal account manager for special operations and rescue helicopter systems. All 98 of the Coast Guard’s Dolphins will eventually receive the Echo upgrade in the course of undergoing periodic heavy maintenance at the USCG’s Aviation Logistics Center (ALC) in Elizabeth City, North Carolina. The process of converting the entire fleet is expected to start in late 2019, and should take about five years to complete on the USCG’s normal maintenance schedule. In the meantime, there’s a prototype aircraft in Elizabeth City, as well as an MH-65 that is more representative of the production Echo model at the USCG’s Aviation Training Center (ATC) in Mobile, Alabama. The first “true” Echo is currently in production at ALC Elizabeth City, and is expected to roll off the line there in December. Although the Echo at ATC Mobile lacks the standby attitude indicator and the full-color weather radar that will be installed on production MH-65Es, it’s already getting rave reviews from the pilots who are tasked with developing training techniques and procedures (TTPs) for the model. The Echo’s large-format MFDs provide the ability to overlay terrain, traffic, and mission data onto a digital moving map, greatly enhancing pilots’ situational awareness. The MFDs and flight management system (FMS) are also integrated with Rockwell Collins’ DF-500 direction finder, which continuously scans for emergency beacons over a large frequency range, then highlights the location of any detected beacon on the digital display. For beacons with embedded GPS coordinates, those coordinates will automatically populate in the FMS, making it easy for crews to fly directly to the beacon’s location and center search patterns around it. 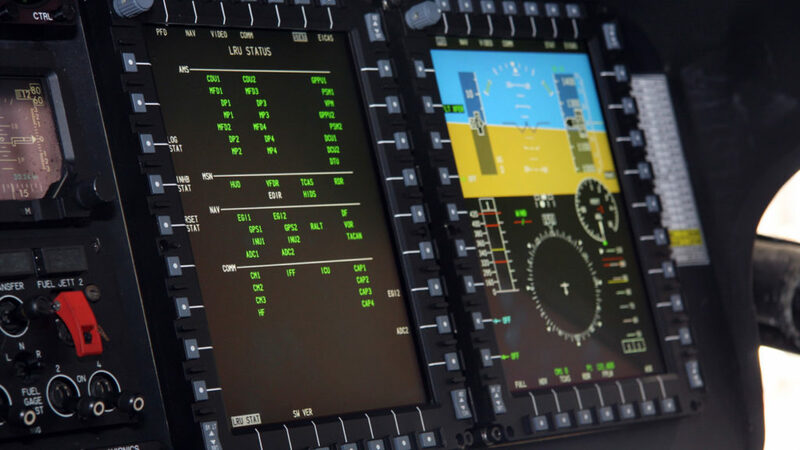 Meanwhile, according to Grave, Rockwell Collins has significantly improved the coupling of the aircraft’s autopilot and FMS, enabling new SAR functions, such as the ability for a crew to deviate from a search pattern in order to look at a potential target, then resume the pattern exactly where they left off. 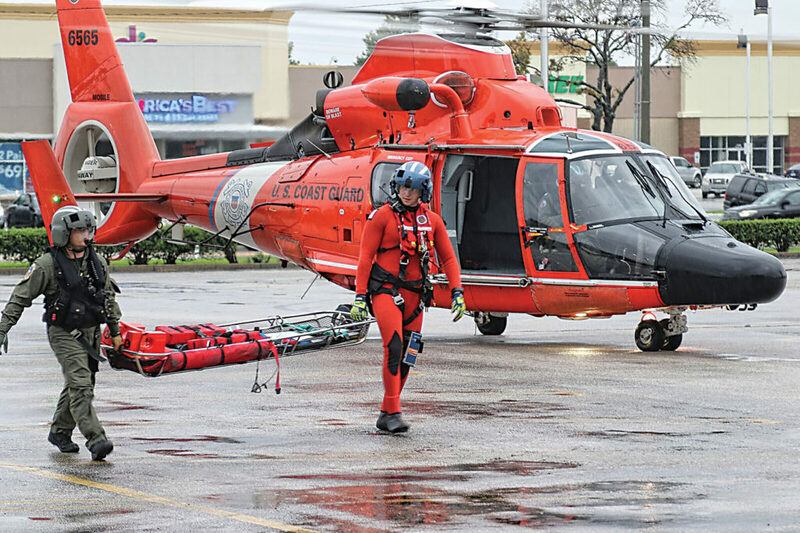 USCG crews at ATC Mobile are particularly enthusiastic about the Echo’s integrated performance planning capabilities, which should prove especially useful during complex, time-sensitive operations like those that followed Hurricane Harvey in Texas last year. “We were going to location X to pick up two people, and then dropping them off at the next location, picking somebody else up and taking them elsewhere,” recalled Hedges, who was among the USCG Dolphin pilots who responded to Harvey. With the Echo, he said, its avionics “will tell you what your hover power capability will be an hour into your flight,” allowing flight crews to more rapidly plan such missions and evaluate new mission requests on the fly. Although Echoes won’t see wider use in the Coast Guard until 2020, the team at ATC Mobile is already working hard to ensure that the MH-65E training curriculum will adequately prepare pilots to take advantage of the aircraft’s impressive capabilities. They are particularly focused on making sure that pilots fully understand the sophisticated automation in the Echo, and have even reached out to the Human Systems Integration Division at NASA’s Ames Research Center for help in developing an appropriate automation philosophy. It sounds like the “Echo” will be the quintessential USCG helo for pushing forward and getting them out as quickly as possible. Perhaps the US Coast Guard could field the lead helo in the Future Vertical Lift helicopter competition via adoption of the S-97 Raider employing the MH-65Es Mission and Communications Systems and provide the increased speed and endurance that will improve the missions set to a whole new level. If the SB-1 Defiant is a better choice based upon size, same comment. How about it Sikorsky?